October 2010 - Tips, eNews and More! If you are reading this newsletter and haven't signed up yet for a chance to win Ticat tickets, what are you waiting for? There are still a few games left this season. All you have to do is go to our website and get into the draw. Everyone who has gone has had a great time. On a more serious note, at the end of May the chief Medical Officer of Health for the province of Ontario, Dr. Arlene King, released an important memo on the value of fluoridation. It is very supportive of water fluoridation, a position long held by the Ontario Dental Association and most dental associations throughout the world. You can see this letter on our website or follow this link to read the letter and see supporting science. Hope you are all well and have a great long weekend. The Halloween decorations are going up so don't be scared by any ghosts or goblins as you enter the office. Is it a perfect ten? A seven, or perhaps even lower? When you look at pictures do you ever wish your teeth were straighter, whiter, more aligned? Cosmetic dentistry allows dentists to perform porcelain veneer 'smile makeovers' which can address all of these issues. We are delighted to be able to offer this revolutionary technique to our patients. Porcelain veneers are custom, porcelain facings that are bonded to the front surfaces of your teeth to cover any imperfections and fix your smile. The veneers are very thin, only about 1 mm thick. That same thickness is "smoothed" off the natural tooth surface so when the veneer is bonded to the tooth, the tooth feels and looks the same thickness as before. Uneven, discoloured, or even damaged teeth can be restored or repaired using this procedure. Click here to find out if veneers are right for you! 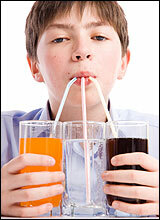 Sugar drinks such as sodas and pops have been getting a lot of attention lately. They are even considering warning label similar to cigarettes on their packaging. If you're like me and enjoy the occasional pop with lunch or during the work day here are some tips to limit the damage to your teeth. Most importantly limit your pop consumption, remember that once it passes through your teeth, the rest of your body has to deal with it and that's a whole other story.